Last year, a total of 128 runners and walkers participated in this annual race. 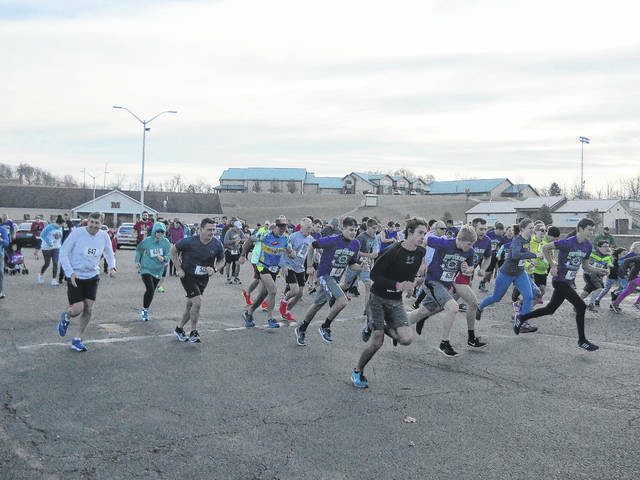 OHIO VALLEY — A post-Thanksgiving tradition in the Ohio Valley, the 17th annual Keep Your Fork 5K road race, will take place the Saturday after Thanksgiving in Pomeroy. “We have it the Saturday after Thanksgiving for a couple of reasons, because our family is able to come in then to participate and because it is fitting being at Thanksgiving with the name ‘Keep Your Fork,’” said Cheryl. Cheryl shared “Keep Your Fork” came from the article “Keep Your Fork, The Best is yet to Come” which was given to her brother. In the article, a woman is dying of cancer and shares her last request with her pastor. The proceeds from this event, which is open to all runners or walkers ages six years and older, will be used to benefit The Brandi Thomas Memorial Scholarship Fund. Participants can pick up an entry form from either BCMR Publications of Gallipolis, Locker 219, Valley Lumber, or any Meigs Local building. Pre-registration can also be done online at www.rivercityrunners1.com, online registration requires an additional $1 processing fee. T-shirts will be given to the first 150 entrants. Plaques will be given out to the top three male and top three female finishers, medals will be given to first place winners, and ribbons will be given to second through fifth place in age groups 6-13, 14-17, 18-22, 23-29, 30-39, 40-49, 50-59, and 60 and over. The winner from the 14-17 age group will receive a special award. This will also serve as the last race of the season for the River City Runners. Donations for this event are welcomed and appreciated. For those interested, send to: The Brandi Thomas Memorial Scholarship Fund, C/O Farmers Bank and Savings Co., PO Box 626, Pomeroy, OH 45769. For further information contact Mike Kennedy at 740-992-2158 (work); 740-992-7552 (home) or 740-357-2723 (cell).